Dental braces are devices that are placed on teeth to move the teeth. For most of us, braces are the most common method to achieve straight teeth. Aside from straightening teeth, braces are used to improve the relationship of how our teeth come together between the upper and lower jaws. Braces for tooth movement fall under the dental specialty of "orthodontics" which is the study and treatment of improper bites (malocclusion). Orthodontic treatment with braces can be for cosmetic as well as structural improvement. The most common oral health issue prompting orthodontic treatment is a bad bite (malocclusion). A malocclusion may be caused by one or more factors:. • Small Mouth: A small mouth can result in a limited amount of space for the teeth to grow. This can foster crowding once the permanent teeth erupt. • Tongue Thrusting: Some children thrust their tongue forward, pressing it against the lips with a force that can result in the protrusion of teeth, or "open bite," among other problems. • Extra Teeth or Not Enough: Sometimes, a person can have extra teeth develop and/or protrude, or certain teeth that do not develop or protrude at all. If you have too many teeth or not enough, your bite can be affected. In addition, the untimely loss of baby teeth or traumatic injury to the face, mouth or jaw can also affect the bite. Wearing braces is simple and generally quite easy with the modern devices available. However, braces do need to be regularly adjusted, and this will make the teeth feel tender for a few days. During this short period a mild painkiller may be needed. A drug-free solution is to chew sugar-free gum, as this will relieve the cramping sensation in the teeth and gums without the need for a painkiler. 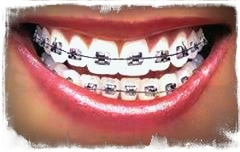 The fitting of braces is generally painless. Discomfort usually occurs several hours after placement of the appliances and similarly after adjustments. • Crowded, blocked, or badly aligned teeth. • Jaws that are too far forward or back. • Early or late loss of primary (baby) teeth. • Jaws that shift, make noise, hurt, or “lock”. • Finger or thumb sucking. • Mouth breathing or snoring. • Teeth that are “crossed over” in the bite (crossbite). • Teeth that meet improperly. • Biting your cheeks or the roof of your mouth. • Facial imbalance or asymmetry. • Tooth grinding or clenching. • Early wear of the teeth. Everyone appreciates the importance of a winning smile. It makes a pleasing appearance, promotes self-esteem, and is valuable to social and career success. Creating beautiful smiles is what orthodontics is all about. Today, orthodontic treatment is convenient and affordable, so that individuals from childhood through retirement can enjoy its important benefits. Orthodontics is important not only to a great smile and improved self-confidence, but to better dental health. By aligning teeth and improving the harmony of the lips and face, orthodontics can improve one’s general attitude toward life. Teeth, and sometimes entire facial structures, are permanently changed by orthodontic treatment. Teeth in correct alignment are easier to clean, and that can make them more resistant to decay and less susceptible to gum disease and tooth loss. Alignment may also prevent tooth and jaw discomfort that can come from uneven wear.